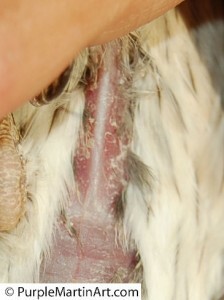 Wing Entrapment CAN Happen to You! 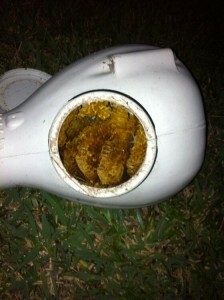 Once again wing entrapment has struck again. Every year (early in the season usually) I have to deal with martins that get stuck in SREH entrances. 2 ASY males, one stuck in the sreh and one within the nest. Unfortunately I was out all day visiting family, came home after dark and this AM this was what I found. 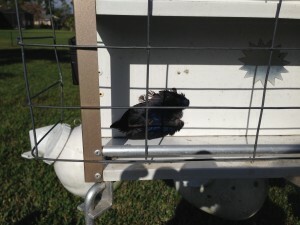 For those that don’t know, Wing Entrapment is when a purple martin becomes stuck in a SREH. 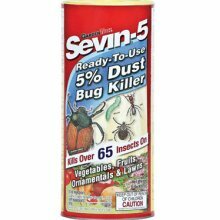 It usually happens when 2 or more martins are fighting over a compartment (nest spot) of any gourd or house with SREH (Starling Resistant Entrance Hole) As one bird tries to leave the nest and is trying to fend off attacks from within the nest from a rival or occupant, the bird gets stuck in the entrance. Basically gets stuck when he turns as he is trying to exit. 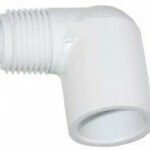 If not discovered fairly quickly the birds in the nest can die as can the stuck bird. 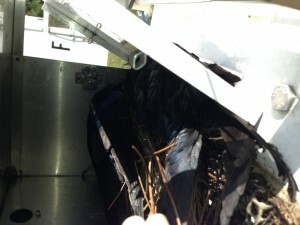 I have wondered if vented rooms vs non vented rooms have a better survival time but this nest was fairly well vented. But still the blocking off of the entrance must have happened early in the AM and as I was out all day, there they sat and died. Those that have reported deaths from entrapment usually say that they discovered it either the same day or within a day or two of the event. It is important to note that this Sunset Inn house did NOT have wing entrapment guards on the inside of the crescent entrances. Also there have been reports of wind entrapment on the large Trendsetter houses that DO HAVE wing entrapment guards. I am not sure if the problem is the thickness of the guard, as the Trendsetter entrapment guard is not the thickest I have seen There is no standard thickness for a guard also and it is hard to just say that thicker may be better, because we are not real sure if at some point, the thickness would hamper their entry and exit into the compartment or cause some kind of situation with young birds crowding at the entrance waiting to be fed. Starlings and Fledgelings and Jumpers, OH MY! So much news and I have really been negligent on the blog. My apologies but between helping customers of PurpleMartins-R-Us.com, 2 kids, a busy colony and a landscape project…I have been swamped! My landscaping project turned out pretty well. Nothing huge. Just redoing the front of the house which had become a snake haven. I moved 3 cubic yards of large egg rock (that’s about 3 tons worth) over the course of a week and achieved my goal of having the front be presentable. 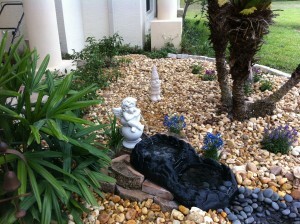 Many thanks to Lawrence over at http://www.butterfliesandwildlife.com/ who gave me some tips and ideas for the fountain. It is a disappearing fountain that recycles water as it flows down a stepped “mini river” of sorts. Though his is much more natural looking and longer, mine was created with basically stuff I already had laying around. 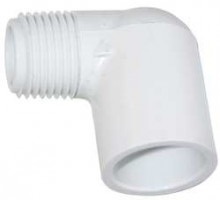 A preformed pond liner, pond pump and hardware cloth. I only added the spitter from Lowes and the preformed stepped river portion was on CLEARANCE for $14! My husband admits it came out better than he thought it would. Of course, he is used to my projects…some of which turn out badly. The purple martins are fledging all over the place. I think there are more youngsters flying about today than babies in nests. 2 skinny jumpers were found on the ground from a nest that I am sure the parents abandoned. Perhaps an Owl or Hawk got them. But I placed them in a low hanging gourd with youngsters in it. I could not lower the rack as so many nests were over 20 days old. For those that do not know, once nests are over 20 days old, babies can jump out during nest checks from fright. 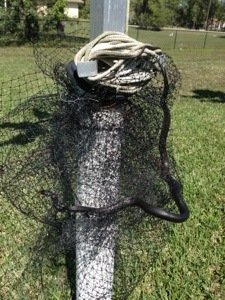 The PMCA recommends that you block off entrances to those nests that are over 2o days old…some say 22 days old by attaching a rag to a string then pulling out the rag once the housing is back up for a few minutes. Just wait 2 or 3 minutes for them to settle down and then pull the rag out. 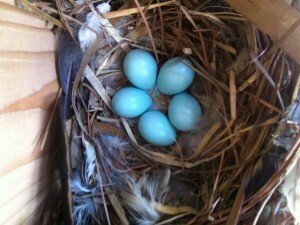 But since so most of my nest were over 20-24 days old, it just wasn’t possible. So I saw them begging and no one feeding them and watched helplessly until they jumped and gave them some Gatorade before sticking them in the new gourds. 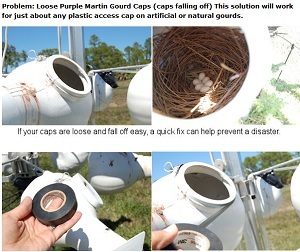 Remember, you can read about common purple martin emergencies and what to do at our store site PurpleMartins-R-Us.com. Starlings took up residence in a flicker box located way to close to my house for the woodpeckers to be interested. But a pair of starlings did. Since no one else wanted the nest box, I let them nest and waited until they were incubating to catch them. I learned something very interesting about them. Once they decided to nest, I was hard pressed to see them both at the same time. They were very quiet, almost as if they knew that I was on to them. I did get a great pic of a starling nest. Very different from a martin nest. Of course, I could have pierced the eggs with a small sharp pin, addled (shook them VIGOROUSLY), or coated them with a thin coat of mineral oil, and let momma starling waste half a season. 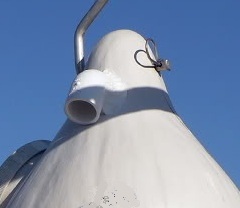 Among one of the most dearly held false hoods regarding purple martins, is the one of the infamous “scouts”. Long to be believed as birds sent ahead to gather intelligence, that then return to tell their flock to start migration back North, scouts are really just the first returning birds. Scouts is still the term we use, for these first arrivers and they are always ASY (After Second Year) birds who are more experienced and familiar with the instinctual urge to fly back North to nest. 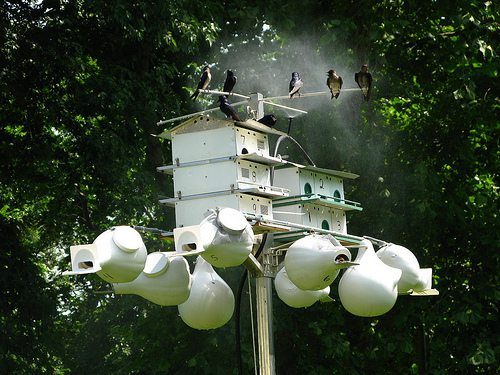 The PMCA (Purple Martin Conservation Association) has the best online tracking tool for landlords that want to know how far purple martins are from them. One can see this scout map at http://www.purplemartin.org/scoutreport/ Another option is to Follow us on TWITTER. 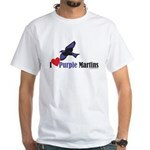 We tweet all kinds of martin related info, pictures from our colony and more. You can also LIKE us on Facebook. 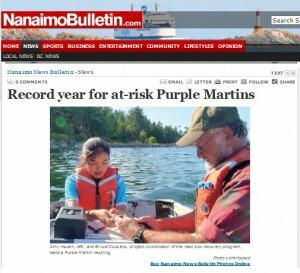 Just look for PurpleMartins-R-Us and click “Like”. Our colony has tons of eggs at a nest check yesterday and even 1 nest with 5 babies. They ranged in age from 3 days old to 1 day old and seem fat and healthy. I am sure these early nests will do well as the weather has been mild and even weekly rain. Though we aren’t getting as much rain as we should, we are not as dry as last year when we had big losses from a drought. A quick note about our BirdCam. It is up. We do not, at this time, have sound and the nest cams are turned off, so that birds can nest. But it is the best we can do. Webcams are not our forte and this cam has been a huge expense for us. Not knowing what we are doing, we sought the help of PalmBeachGeek to get the one we have online. There is a limit to the number of people that can be watching the cams at any one time, so if it doesn’t work, keep trying. Also if it doesn’t work for you, send us a quick email letting us know what your problem is, what internet explorer you are using (Firefox, Internet Explorer,Chrome) and we will try to improve things as we work out the kinks.